We were kind of joking when we said Sen. Norm Coleman and Gov. Sarah Palin had something in common due to their love of Nieman Marcus. Turns out they are much closer than we thought! The Atlantic is reporting that Sen. 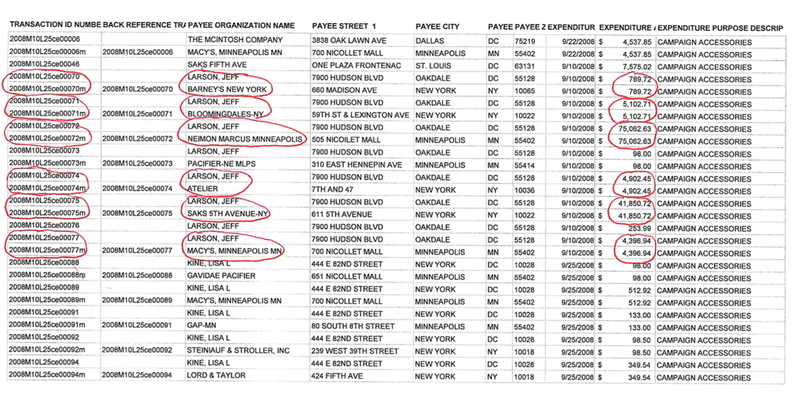 Norm Coleman's buddy Jeff Larson was Palin's personal shopper. Imagine that! Larson was sucked into a summer political drama when the National Journal reported that he was giving Coleman a sweetheart deal on a $600 a month apartment on Capitol Hill. Check out Palin's wardrobe receipt after the jump. Larson and his company FLS Connect have most recently been in the news for his work on the Sen. John McCain robo calls that drew bipartisan criticism. To check out the receipt, listing Larson's purchases, click here. The attention from Jeanne Cummings's much-talked-about Politico story has naturally focused on the $150,000 in luxury clothing purchased for Sarah Palin at Neiman Marcus, Sak's Fifth Avenue, and Barney's. What hasn't yet gotten any attention is who bought it for her. But buried in the same FEC disclosure form that revealed Palin's taste for the fine life is the name of the man who appears to have been her personal shopper: Jeff Larson. Under FEC regulations, the RNC must file what is called a "Schedule F form," which lists "expenditures made by political committees or designated agents(s) on behalf of candidates for federal office." Along with the matching dates and dollar totals, note the "Transaction ID Number," which clearly connects the questionable expenditures with reimbursement payments made to Larson. Looks like Larson likes to do favors for the Republicans. Whether it's a bedroom to crash in or shopping sprees, count on Larson to be by your side!